At about 2315(LT) on 29 September 2011, the motor vessel Purki was sailing out of the port of Alger. An ordinary seaman (OS) stationed on the forecastle was tasked with releasing the tug secured to a ship’s line to the starboard mooring bitts through the centre panama lead. The tug line was slack on the main deck but still fast to the tug boat. Suddenly, with three turns still on the bitts, the tug line came under tension once again, removing any slack and as a consequence, striking the OS in his legs. It is unclear whether the OS was injured as a result of being in the “snap-back” zone or because he was standing in the bight of the line that hit his legs. It soon became evident that the crew member’s accident was serious albeit not life threatening and first aid was administered. At 2330, the Master requested the pilot to return into the port but this was refused and he left the vessel without assisting any further. The Algerian authorities and other interested parties were informed of the accident and a Coast Guard delegation boarded the vessel shortly after. Whilst the chief mate was preparing a statement for the Coast Guard, the second mate was tasked to make preparations to transfer the injured crew member ashore. At 2340, the vessel was logged as adrift about 1.5 nautical miles off the port of Alger. The master acceded to a suggestion by the second mate to utilise the container lashing gear storage box as a makeshift platform. The following photo shows the frame used to hold the container lashing gear storage box used to lower the injured OS on the pilot boat. The OS was placed on a stretcher, which in turn was placed on top of the container lashing gear storage box. Accompanied by four crew members, the storage box was lowered down the ship’s port side, using the ship’s cargo crane. The plan was to transfer the injured crew member to a boat, which was standing by. On 30 September at about 0010 hours, the boat made heavy contact with the container lashing gear storage box whilst manoeuvring alongside the ship. 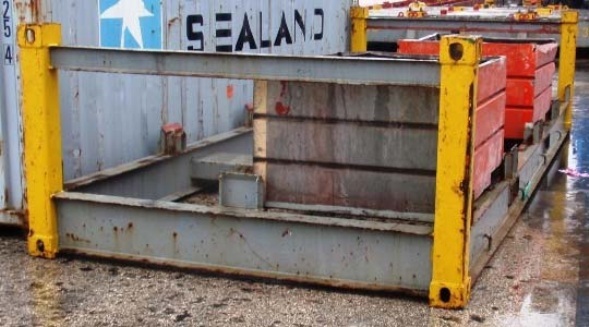 The impact of the boat against the lashing gear storage box forced the release of the storage box’s lifting strops from the crane hook. Consequently, all fell into the sea. The chief mate and oiler boarded the vessel again using the pilot ladder and subsequently, the ship’s rescue boat was launched. The second mate was not accounted for and the alarm was raised. Reportedly, the boat sent by the authorities could not assist any further and the injured OS was transferred ashore with the ship’s own rescue boat. several miles away, on 01 October 2011, at about 1409. There was no reference or record of a risk assessment being carried out for un/mooring operations and vessels under tow. It was probable that the crew members did not have the opportunity to conduct a risk assessment of the mooring operation. The investigation was unable to trace any SMS documentation reference to relevant safety requirement in records; particularly vigilance to avoid standing in the “bight of a rope”; or in the snap-back zone of a tightened rope. Additionally, the investigation could not confirm the actual effectiveness of the familiarisation of the crew members, which would also have had a bearing on the approach taken on the forecastle deck. The casualty should have been evacuated either by helicopter or lifeboat. If the first means was not available, there should have been no hesitation in launching the ship’s rescue boat or lifeboat to carry out the evacuation as indicated in the SMS Manual. Although according to the master, the main deck was not wide enough to carry someone to the rescue boat (located aft) by a stretcher. There was no evidence to show that training and drills in the event of an evacuation of a casualty from different areas on board have been held or that such drills and training were required by the Company’s SMS. 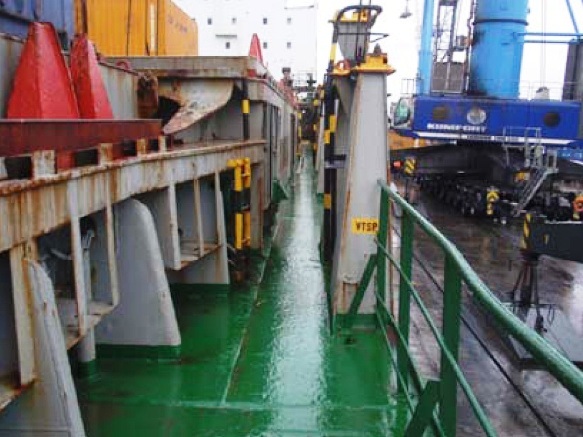 This is being highlighted because the problem of narrow deck passages was only identified during a real case scenario, when ideally, it should have been identified during one of the drills held on board. There was no information as to whether or not the transfer was being co-ordinated at all; there seemed to have been a breakdown of communication between the Alger pilot boat and the vessel. From the evidence collected, it was apparent that during the transfer, none of the crew members involved in the accident wore lifejackets. Moreover, there were neither any lifebuoys close at hand nor was the rescue boat launched as an added safety precaution. 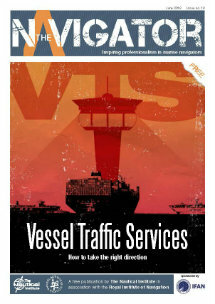 Update the SMS Manual in particular on a requirement to carry out a risk assessment for mooring and / or towing operations, in addition to encouraging the use of “toolbox talks” to enhance health and safety awareness where specific operations are undertaken, including the use of lifejackets when conducting overside operations. 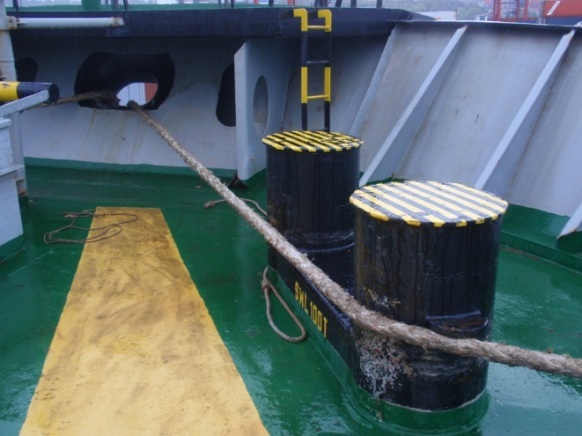 Discuss with crew members and introduce measures to improve safety during mooring/unmooring operations, taking into consideration the potential of a tug line coming unexpectedly under tension. Emphasis through their SMS manuals that on board crew training includes casualty evacuation from different areas of the vessel which are not classified as enclosed spaces. Prepare and circulate a fleet memorandum on the accident and highlight that cargo gear is not to be used as a means for crew evacuation.